Trachea and carina resection and reconstruction is a difficult surgical technique. In the past, such procedures were completed via large incisions (Pearson FG, Thompson DW, Weissberg D, Simpson WJ, Kergin FG, Ann Thorac Surg 18:16–29, 1974) and, consequently, patients’ time to make a full recovery was much longer. In addition, the high potential for postoperative complications have led to many thoracic surgeons avoiding performing these procedures. With the advances of surgical techniques and equipment (Jiao W, Zhu D, Cheng Z, Zhao Y, Ann Thorac Surg 99:e15–7, 2015), including advances in the management of anesthesia, the implementation of tracheal and carina resection/reconstruction is now feasible under complete video-assisted thoracoscopic surgery (c-VATS). 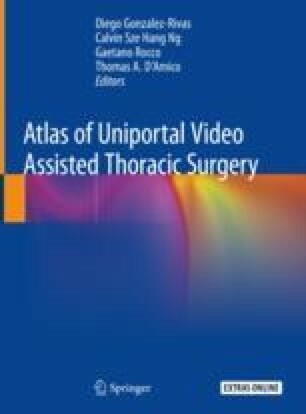 For surgeons with extensive VATS experience, the uniportal technique is also a feasible and safe choice that further reduces surgical injury and may accelerate postoperative recovery. Here we introduce two cases: one tracheal and one carinal resection/reconstruction performed under the uniportal VATS technique. The online version of this chapter ( https://doi.org/10.1007/978-981-13-2604-2_31) contains supplementary material, which is available to authorized users.